Our new program for Term 2 of 2019 is now available here. 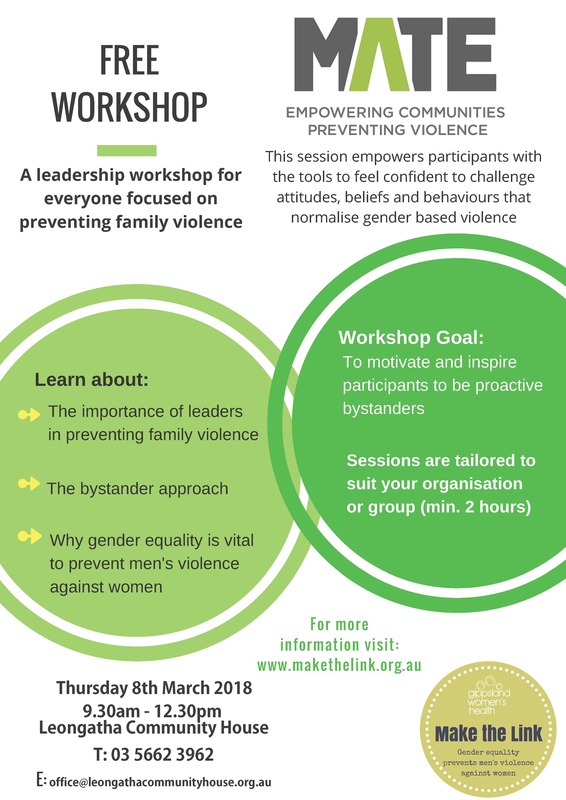 Community members are invited to a special workshop at Leongatha Community House to learn new ways to respond to family violence. “Bystanders” are all of us who need to play a role in any number of situations, from things that are overtly abusive to things that seem quite harmless but have problematic consequences. Bystander training empowers us to educate, encourage and challenge those around us to do better. A critical aspect of the bystander training is to provide concrete tools to help address problematic behaviour. We are often socialised to be passive in situations, to “mind our own business”, and to not intervene in matters “that don’t concern us”. MATE bystander training aims to take the “do nothing” approach off the table, and allow people to step forward in difficult circumstances. Phone 5662 3962 or email office@leongathacommunityhouse.org.au to book your place. Representatives from the South Gippsland Neighbourhood Houses network met today with local M.P. Danny O’Brien to deliver more than 250 signed postcards signed by community members in support of a Victoria-wide campaign for increased State-Government funding for neighbourhood/community houses and learning centres. Neighbourhood Houses Victoria, the peak body for Victorian Neighbourhood Houses and Learning centres, is leading the campaign to ask the current Victorian State Government to deliver on its 2014 Election Campaign commitment to invest in Neighbourhood Houses. Each week, the Neighbourhood Houses in the Gippsland South electorate represented by Mr O’Brien receive over 1,300 visits from community members, and deliver over 150 hours of service to their communities. They respond to local community needs, yet there has been no increase in funding to Neighbourhood Houses for many years. They face increasing needs and costs, yet in practical terms have experienced an erosion of their funding. The issue of funding is particularly acute in Victoria’s growth corridors, and those suffering the effects of rural isolation and the loss of employment opportunities through industry closures. Right across Victoria, Neighbourhood Houses deliver over 10,000 programs addressing digital literacy, disengaged youth, unemployment, childcare, emergency management, food security, family violence, mental health and well-being, training and education, integration of new arrivals and refugees, rural isolation, ageing, social enterprise, offender programs, community resilience and connectedness, and much more. Pictured L-R: Jenni Keerie, Milpara Community House Manager (Korumburra), Eunice Donovan, Leongatha Community House Coordinator, Rebecca Matthews, Manna Gum Community House Community Development Coordinator (Foster), Danny O’Brien MP. If you’d like to contribute to the campaign by signing a postcard, contact any Neighbourhood or Community House close to you; every signature will help!